A Safari hat...I wonder if it came from a zone of the safari variety? Currently, this is planned to be a reward from 세계일주 조련기. The achievement Taming the World now awards the Safari Hat, which increases pet experience gained from Pet Battles by 10%. To be completely honest, I fully expected this hat model to be a red and white baseball cap. Ten percent really isn't a lot. Once you have Taming the World, what's the issue with 20% or even 25%? You'll already have the Tamer title I assume, so it's not going to be getting you anything special any faster and why do you need to raise more pokemon after that in the first place? ...Unless they're adding more NPC trainers and even more titles and/or things to get. LOL I love the red baseball cap idea! I def look forward to working towards getting this, since I enjoy pet battles when I get bored of dailies, rep grinding, raid off nights, or can only play for a short amount of time. Cheers for future expanding pet battle items, creatures, whatever, etc! OK here's a question... what if you've completed this achievement? I only have a few trainers left to finish off. would you get it retro in the mail? I forgot what they did with other things they changed the rewards on. Well, it's 5.1 and I've not received my hat even though having completed Taming the World. It did not appear in my mail like my bag of gold did for completing The I Choose You achievement. Edit: Perhaps it is something that takes time to receive. After all, the patch did only come out a few hours ago. I had previously completed this achievement, according to the patch notes today this is the reward for Taming the World, however I did not receive my hat nor is it mentioned as a reward when viewing the achievement. I wonder what the deal is? I decided to go into AQ40 on my Rogue (My alt) to do some pet farming. Suddenly spammed with a million achievements. Some of which I'm sure I shouldn't have....and I ended up with some interesting mail. This was one of the things in my mailbox. Thankfully it's BoA! Yay! Leveling Hat! Like the heavy sack of gold from Aki, this only gets mailed to one character per account. And just like the sack, I ended up getting this on the 'wrong' character/realm. Guess I've got a new pet battling main! For those who may be curious, it appears as though you'll receive the hat on every realm you have a character on. I had the hat and accompanying mail in my box on the three different servers I checked. I can't believe it. You are really taking these tamers out! I have been watching your progress and its amazing! you are just taking out tamer after tamer. I figured this hat might be useful to you on your quest to the final Zen Master in Pandaria. Zoning in a dungeon gave me the Safari Hat, lol. If you're Horde, run into RFC. If you're Alliance, run into the Stockades. Sadly, this hat cannot currently be used for transmogrification. Is this thing working or is it bugged? Doesn't feel like it's working... Takes same time to level the pets.. Don't see much difference in XP gained.. I didn't got mine, tried the methods suggested here in the comments and still no luck. I've then submitted a ticked and the GM said "it is indeed bugged at the moment so just to let you know that I've sent the Hat to you in the mail". The mail was from Blizzard CS and not from Breanni, so I suppose they can't just "re-send" the achi reward to you by normal means. For me non of the below options worked. Also strangely enough I wouldnt have known I should have recieved this reward if I hadnt read the pet battle guide on wowhead, because it doesnt show on my achievement tooltip, meaning the achievement itself didnt say "reward: safari hat" where normally the rewards are standing if that makes sence. As of today, the achievement is bugged to some players, including me. I had completed all the Taming achievements prior to 5.1. When patch was released, I didn't get the hat. I did the Spirit Tamer achievement, defeated the Darkmoon trainer and tried some of the tips listed here and nothing worked. After contacting a GM I was told that this is a known bug being worked on, with no ETA :(. We will soon be applying a hotfix that causes level-25 pets to no longer “steal” experience from your lower-level pets. Previously, if you had a level-3 and level-25 pet grouped together for a battle, the XP earned would be shared between the two at the end. This resulted in some players doing what they could to kill off their level-25 pet so the level-3 pet would get all of the experience. You no longer need to worry about this as the level-3 pet will now receive 100% of the XP that’s earned, so long as it has participated in at least one round of combat. If you forget to equip this, you can open your character screen (with 'C') with the pet interface up and pop it on before you complete the match. After maintenance today (just after the 5.1a patch), all my characters have received one in the mail, so I no longer have to pass it around to different characters if I want to pet battle while leveling a character for example. Was driving me crazy.. solved all quests for all regions with several characters on both factions. Nothing happend. Tried all tricks and tips her on wowhead as well, die the achievement before 5.1. Today out of nowhere it arrived. I had an Item in the auction house and when I received the mail selling the item it triggered the Safari Hat as well. Good luck to all still waiting for it. Happy it's finally here. If you equip this hat mid-pet-battle do you still get the bonus XP, or do you have to equip it prior to initiating the battle? After getting this hat in the mail on all my toons, I decided I would like to see if anyone has any suggestions as to what gear would look good with it on a level 1 bank alt. I know that the options are quite small, but I am hoping someone could give some suggestions. In the real world, this item is commonly referred to as a Pith Helmet. What i would love to see on this hat is a +10% increased chance to find a rare quality pet. (that is, in fact, the reason most ppl are alt tabbing to wowhead, you know. Not to hear everyone's opinion of what this hat should be xmogged into if only it COULD be xmogged. Just curious...why go for an addon to wear a hat? Just click on it from your bag. Seems pretty simple enough. You get this hat for being the very best. What i want to know, is who exactly disenchanted this hat to see what crystals it would give o.O? So I got this a few weeks ago, fun times. Today I made a lvl55 dk cause I had 5 mins to kill, turned out I could'nt delete the character because the hat was in the mail, thanks Breanni. That means I have to do the entire first part of the quest until I can get to the little town and access a mailbox, pretty annoying. Currently as of Friday 17th May 2013 - I became aware that I was not receiving the + 10% XP you should get when wearing the Safari Hat. I submitted a ticket and was then asked to raise it as a bug to the dev's. So be aware there is currently a bug with the hat. I've just recently got this hat and i LOVE it! I've taken the time to make a sort of lookalike safari set for this hat, but there are much improvement to be made. Keep in mind that this is not for transmogrification purposes, but rather to wear AFK or while batteling other pets/Pet Tamers/PvP players. I HAVE SUBMITTED A PICTURE OF THE SET ON THIS FORUM! CHECK SCREENSHOTS! i will post a link when the screenshot has been throught maintenence and has been published. Once again, the set is not finnished and I am doing my best to improve it as good as i can. If you have suggestions to items that could be added to the set, please let me know. Better leggings would be good; I am yet to find a pair of pants in that color(ish) that goes to about the knees. Skirts (in that color) might work for females! Thanks in advance for helping me! You can get all 19 Daily Pet Supply Bags every day in about an hour? Elfuego of wowpetbattle.com has mapped out an extremely efficient route to complete all three books for the Beast of Fable questlines, all the Grand Masters and all the Pandaren Spirits and posted it to his website so you can utilize it also! Be sure to check out the map HERE. If any of the fights are slowing you down, you'll be happy to know there are also detailed guides to help you smash through every opponent on the way so you can get all your Pet Supply Bags everyday in about an hour also! And, if you need help in finishing your 10 PVP battle wins for the Brawler's Pet Supplies, be sure to check out the brand new PVP Battle Pet Teams section where he has suggested some team compositions to help you increase your odds of winning a PVP battle! Anyone else noticed that your character's experience from the pet battle is reduced by the same 10%? As of 6.0.2, the Safari Hat is no longer wearable. But that's good news (everyone)! It no longer replaces your helm. On use, it applies a buff, 탐험대 모자, to your character. It also decorates your character with the hat appearance. You keep the benefit of your helm and reap the bonus experience to your pets. No more forgetting to swap your helm off and on! Woot! Also be aware to not click it while flying now, it will dismount you. As of 6.0.2 this is no longer a hat/helmet you wear, but is now an item you click to give you a buff that transmogs your current helmet into a safari hat. You still get the 10% xp boost but now no longer have to switch hats to get it. A small quality of life change from Blizz. Since no one has pointed out: you will need to toggle the buff off if you're going for a haircut. Otherwise the hat still remains on your head. Same problem if you try to: Game Menu>Interface>Display>Show Helm toggled off. PS. Would be awesome if this was stored in the Toy Box collections or in a heirloom-like system. Haha I'm so stupid for not checking the hat up here before trying to find it. Logging every char and checking bank just to see here that its added to the toy page! 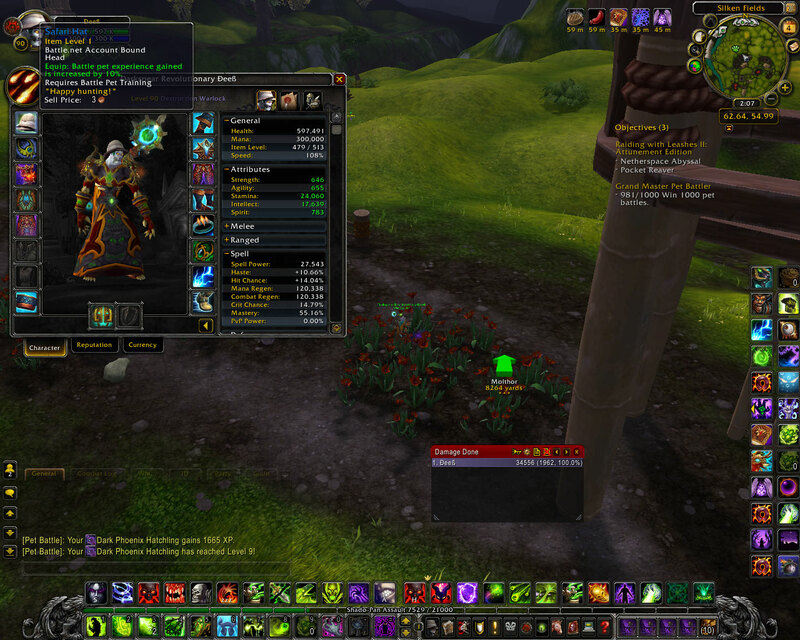 I'm sure this is probably included in an addon somewhere, but for those who would like a simple little macro to use, this will put on your safari hat, or take it off (depending on whether the hat buff is currently active or not) with a single button. Safari Hat now shows up in your Toy Box after acquiring the Taming the World achievement. I did not see any on screen notifications telling me so. I didn't get any in-game mails telling me anything. Submitted a ticket. Logged out. GM replied saying it gets automatically added to Toy Box. Logged back in and confirmed. I wasn't interested in pet battling until I saw someone use this hat as part of his explorer transmog, similar to those in the screenshots.